We've configured this industrial computer for image capture, display, processing and storage. For capture, there are four Power-over-Ethernet (PoE+) ports and four USB3 ports for connecting cameras. 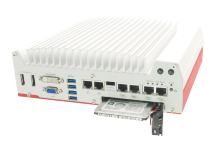 Each GigE port has its own independent controller for maximum bandwidth. For display, there are three independent VGA/DVI/DP 4K2K video ports. For image processing, the Skylake i7-6700TE CPU with 8 MB cache can handle multiple cameras having high frame rates. The 32 GB DDR4 memory allows space for your application to buffer images and smooth the work flow. A 256 GB internal SSD is included for the operating system. But for image storage, we recommend mounting a 2.5" hot-swappable SSD or HDD in the internal SATA 3 tray. This is truly an industrial imaging platform. The design is free of moving parts and, even without a fan, can handle hot environments. The optional 16 or 32 integrated 24 VDC discrete I/O are available for interfacing with your process. Why should you choose a computer without moving parts? Because it’s the moving parts that fail first. When a cooling fan stops turning, or the hard-disk drive stops spinning, it is sure to be expensive. It isn’t hard to build a consumer-grade “gaming” computer. But building a fanless system that can handle industrial environments is another matter altogether. The Neousys design puts the CPU right up against the large external heat sink. It can handle 70 degrees C, even with its 5th generation Skylake i7 CPU under full load. Compare the performance of the i7-6700TE against other fanless embedded computers intended for machine vision. This chipset scored 9044 using Passmark Performance Test software. That’s 20% better than our previous generation. The CRNS365 has six Gigabit Ethernet ports. Four of those ports can deliver Power-over-Ethernet (PoE+), so cameras and other devices can be powered without pulling additional cables or purchasing external power supplies. To maximize bandwith, five ports have independent Intel I210 controllers, with the sixth having an I219 controller. All ports support jumbo packets to keep CPU interrupts to a minimum. The I210 controller is supported by the Basler Pylon Performance Driver (version 4.1.0 and newer) and the SVS-Vistek driver (single-port configuration only) to further enhance imaging performance. The CRNS365 offers optional integrated discrete I/O for interfacing with PLCs, light controllers, and other devices. Choose the 16 channel board, or the 32 channel deterministic board. The 5 - 24 VDC inputs are optically isolated, and can be programmed for polling or change-of-state interrupt. The 24 VDC discrete outputs are also isolated. Alternate configurations are available for volume customers. Suggested accessories include power supply, DIN rail mount, expansion drive, I/O cable and I/O termination board. Operator System Configured with Microsoft Windows 7 Professional with PS1 64-bit; Factory has also tested Win 7 32, Win 8.1 64, Win 10 64, OpenSUSE 42.1, Fedora 23, Ubuntu 14.04.4 LTS and 16.04 LTS, Debian 8.3.